When visiting the Morocco Sahara desert or Merzouga, M’hamid or Zagora you will be offered the option of a standard or luxury tent. When you go on a camel trek or by a 4X4 in the Moroccan Sahara there are many options of places to stay. There is a wide range of Standard bivouac camps, several top end Luxury Bivouac Camps and also Luxury Guest Houses all worth while of consideration. Depending on the amount of time you want to stay in the desert and your desire for privacy it may be worth your while considering a luxury tent or bivouac. There are a number of standing camps and the luxury ones are private, usually for two or more people with superior furnishing and bedding , showers and a toilet and a tent or area for relaxing. Meals are provided. If you plan a romantic night under the stars (there are special honeymoon tents) or you want to enjoy the desert in comfort, this is for you, but the experience comes at a price. 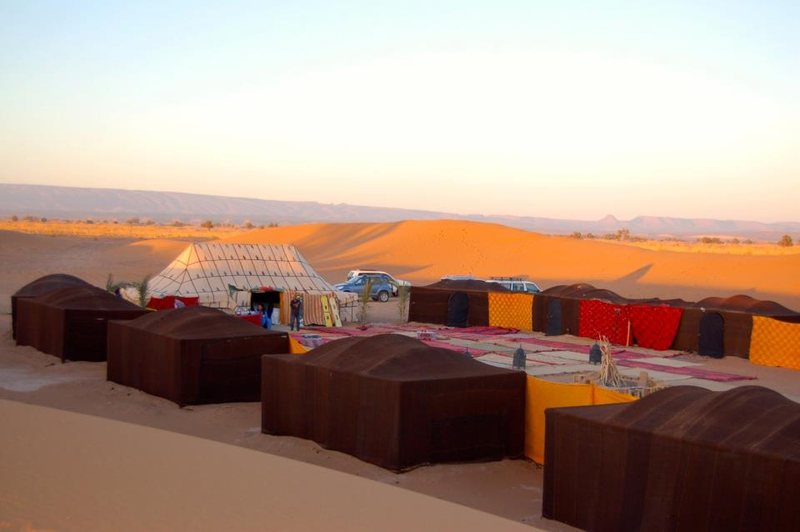 The campsites which offer luxury tents include Le Belle Etoille, Travel Exploration Morocco, Assou, Les Nomade and Le Red Sand Luxury Desert Camp. At these Morocco Sahara Desert Luxury camps the tents have been designed by top French interior designers. They have 6 tents of around 30 square meters. Each tent has its own bathroom (hot/cold running water) and toilets. This is a permanent camp offering tailor made excursions for relaxing, or more adventurous desert tourism with various sporting activities. The Erg Chigaga Luxury Camp, can accommodate 16 people in 8 tents. The tents are spacious (25 sq m) with the highest quality mattresses, linen and pillows, whilst each tent is equipped with ‘wall-to-wall rugs’, solar-powered lighting and handcrafted furniture. Each tent has en suite facilities. For those seeking privacy, the Erg Chigaga Luxury Camp has two private camps each situated within a 15-minute walk from the main camp. Each camp consists of two luxury en suite tents and a separate relaxing tent, nestled in the dunes. For those that want a trip deep into the Sahara desert and to sleep in a different locations each night, they have a nomadic camp for camel treks of 3 and 4 days’ duration. These are also privately run trips, with each camp accommodating between 2 and 4 guests. The nomadic camps are ‘semi-luxury’, with a comfortable bed and fresh linen, private bathroom, Moroccan lounge and cold drinks. 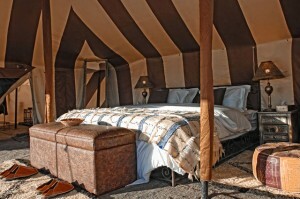 The standard berber tent is simply a tent to sleep in for the night without any other facilities. These may be out in the desert but most are in regular camping sites which have shared facilities showers and toilets. The standard camps are large and shared with other tourists who often stay in local hotels and visit the campsite for a night out in the desert with a meal and entertainment with traditional music and dancing which can go on late into the night. You need to make quite certain about what services and excursions are offered including a luxury or standard tent, meals, availability of bottled water excursions by camel or 4X 4 and pick up and drop for your onward journey. All this should be agreed beforehand so ask your travel agent to agree the details. If you are agreeing a deal either with a tour company in Marrakech or actually at Merzouga you need to confirm all the details very carefully before you pay for the trip. You can also stay in a desert camp near Marrakech in the Agafay area an hour’s drive from Marrakech if you do not have time to visit the desert locations in Merzouga, Zagora or M’hamid. You are currently browsing the archives for the Luxury Bivouac category.